Mojang continues to celebrate the season, with the free Minecraft Winter Gifts Bundle now available to download on the Minecraft Marketplace. This contains 13 packs from community creators, which are the Winter Wonders Skin Pack (Minecraft), Hollydale (Blockworks), Snowball Warriors (Pathway Studios), Christmas Jumpers (57Digital), My Snowy Journey Skin Pack (Toya), Lucky Present Survival (Jigarbov Productions), Ginger and Alaska (Visula), Snowstorm Simulator (Snowstorm Simulator), Norse Mythology Bonus Skins (Minecraft), Santa’s Gift Hunt (Polymaps), Ugly Jumper Contest (Razzleberries), The Lost Civilisation (Blockception) and Ready Sleddy Go! (Noxcrew). 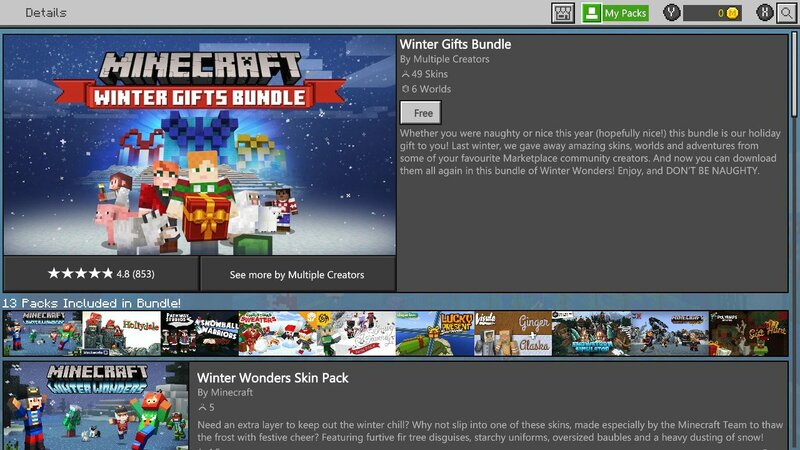 “Starting today until 3rd January 2019, you can download the Winter Gifts Bundle from the Minecraft Marketplace. This completely free bundle is stuffed with worlds, skins, texture packs and more, all from your favourite community creators!” Mojang explains.